Many expats come to Costa Rica to escape harsh winters somewhere far north of here, but in Tamarindo, regular sunshine and consistent temperatures are just a few of the many reasons people stay. There’s a great sense of community in Tamarindo. Many people who move abroad quickly learn that when you are so far away from family and friends, it becomes vital to build a network of people who become a sort of second family. Locals and expats alike in Tamarindo are hailed for their friendly and warm, welcoming disposition. 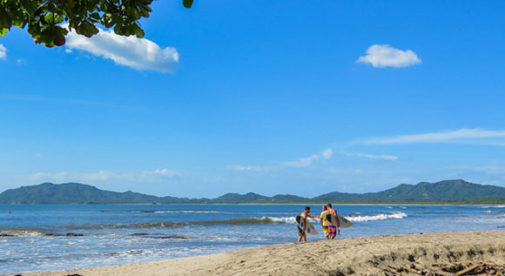 While it’s the most developed beach town along the northern Pacific coast of Costa Rica, Tamarindo, at its core, is still a small town where everyone knows your name. To further lend to this instant community connection, Tamarindo is renowned for drawing people from all walks and stages of life. And not just North American expats, but those from all over the world too. Whether you’re searching for your ideal retirement haven, or ready for a career change and looking for the perfect place to start a business; whether you’re a family with kids or a young digital nomad looking for a home base from which to work remotely, you’re certain to find like-minded people in Tamarindo. And there’s one thing that nearly every expat who comes to Tamarindo shares: the desire to find a more well-rounded and relaxed lifestyle, allowing them to re-center and re-focus on the important things in life; like health, happiness, friends, and family. Groups form to help you network. For example, there’s a group called “Work Anywhere Tamarindo, ” which meets monthly and serves as a networking system for remote workers and business owners. There’s a group of expat women who started Ladies Night, a weekly dinner for expat women ranging from their 20s to their 70s. An opportunity to socialize and support one another. There’s a group for expat mommies and a woman in town who offers Spanish classes specifically for expats on Friday’s at a restaurant right on the beach. With a diverse cultural fabric, Tamarindo also presents some cultural conveniences and even luxuries you won’t find in many other Central American beach towns. One example that many love about this surf town is the international variety of cuisine, ranging from fast food to fine dining. Everyday conveniences make Tamarindo a viable long-term destination for expats as well. The downtown area is concentrated and walkable, hosting pretty much any service you might need on a daily basis. Each of Costa Rica’s major national banks has a branch in town and there are three grocery stores—as well as several smaller markets and the weekly feria (farmers’ market). You will find several gyms offering specialties, from Yoga and Pilates, to circuit training and CrossFit. A couple of places in town offer services like photocopying, passport photos, and fax. There’s a local UPS if you need to ship something out, and a couple of hairdressers to choose from. A public notary, someone who specializes in taxes for expats, and a few small dental and health clinics are available right in town as well—including one 24-hour emergency clinic that can handle minor injuries. The town’s own cultural identity is also growing. In 2016, Tamarindo hosted its first-ever art festival, The Tamarindo Art Wave. The festival drew international artists specializing in a variety of different mediums and was part of an ongoing effort by community leaders to continue to infuse and embrace culture in this beach community.